Palmako Ines 1 Log Cabin: The Palmako Ines Log Cabin is a mid-sized Log Cabin suitable for most garden sizes and features our Double Glazed Bi-Fold Doors featuring their extra low sill covered by a protective Stainless Steel Finish for ease of access. The superb quality, Double Glazed Bi-Fild doors are fully glazed featuring 3mm/9mm/3mm Glazing Units. 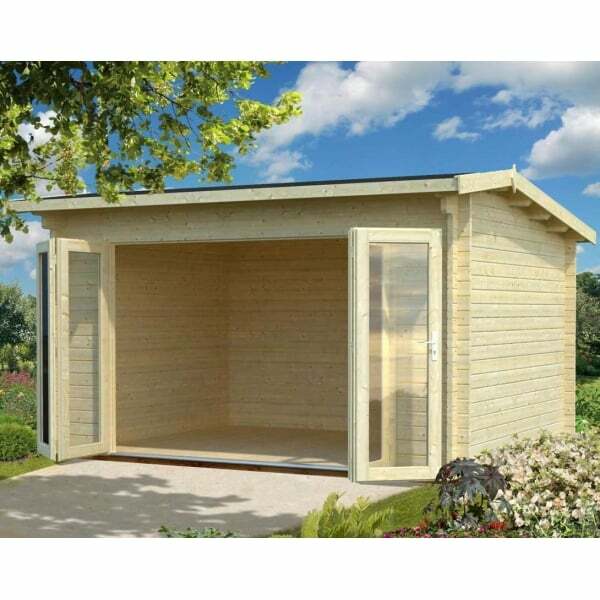 This simple but very attractive Log Cabins lends itself to many potential uses including as a Garden Summer House or garden office style Log Cabin. Many customers would use this type of building as an outdoor dining room or relaxing space in the garden but as the specification is 44mm wall logs and the glazing is double glazed - the building can easily be used as a garden office or general extension to the living space for 12months of the year.